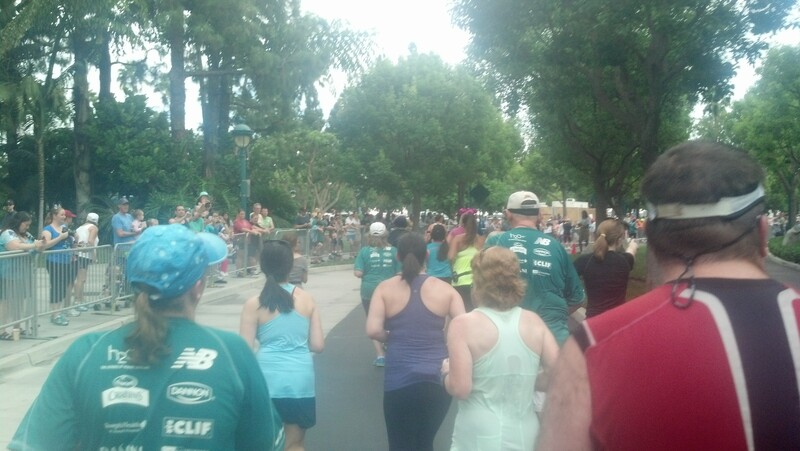 While the above video covers BOTH races I finished this past weekend, this post will focus on the Inaugural Disneyland 10K race. 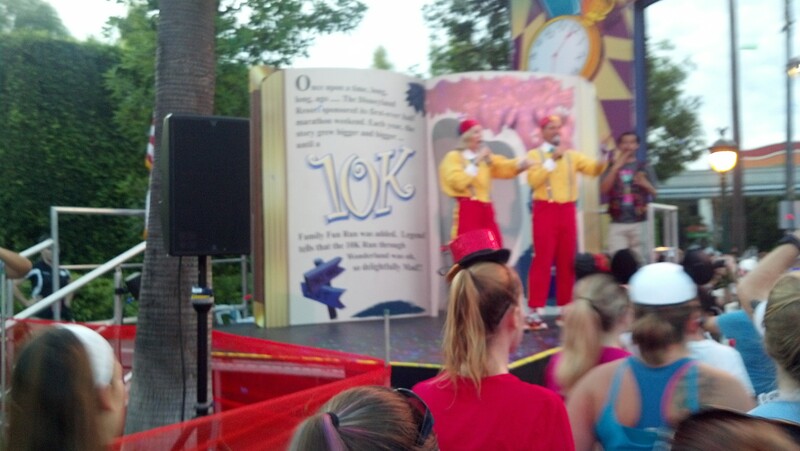 Not only is it the first 10K race at Disneyland, but it was the first 10K runDisney race period. 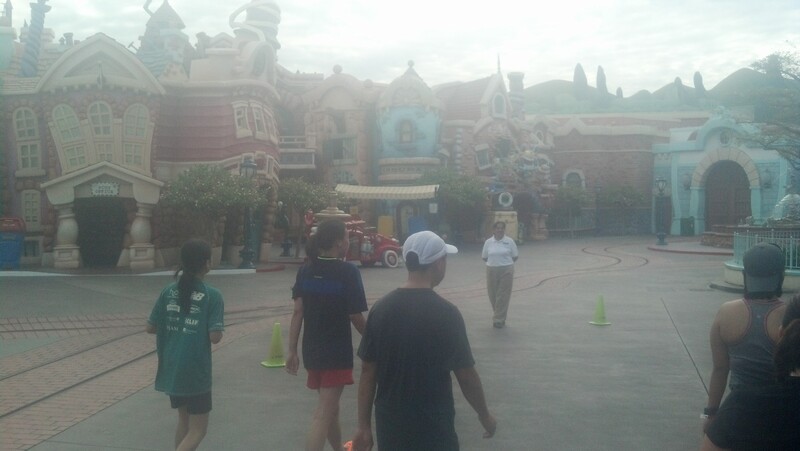 With the new Dumbo Double Dare challenge, it brought out plenty of runners. 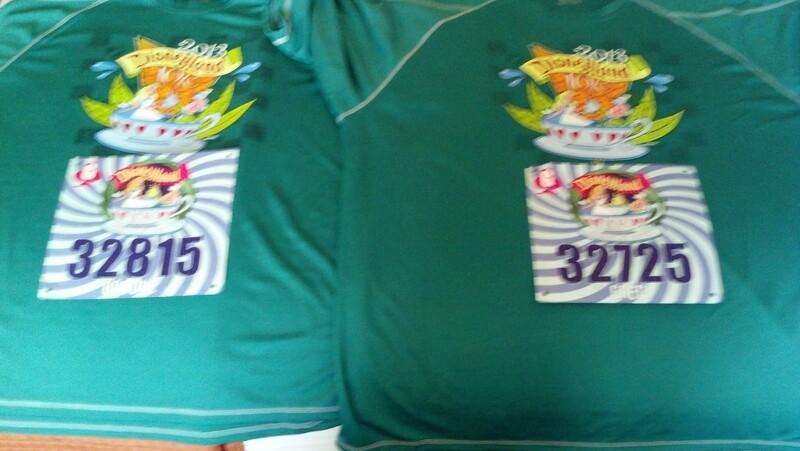 This was the race that both my wife and I would do together. It was her first 10K race. So, my plan was just to have fun and make sure to be her biggest cheerleader if she wanted to quit. 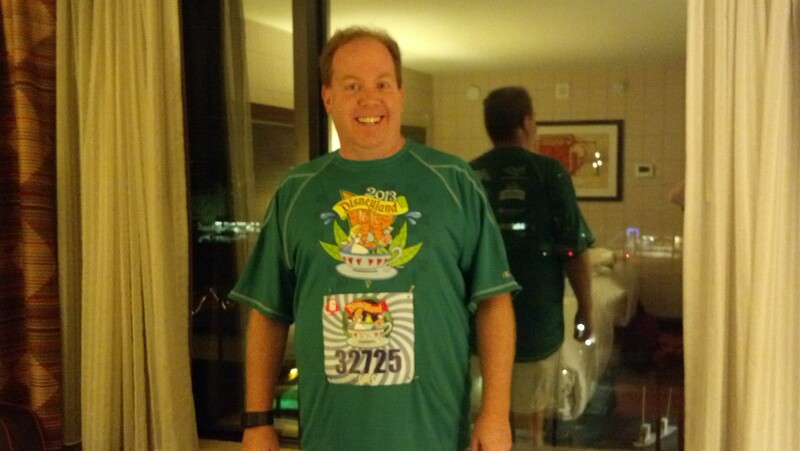 We woke up at 4am to get ready for this race that started at 6:15am. 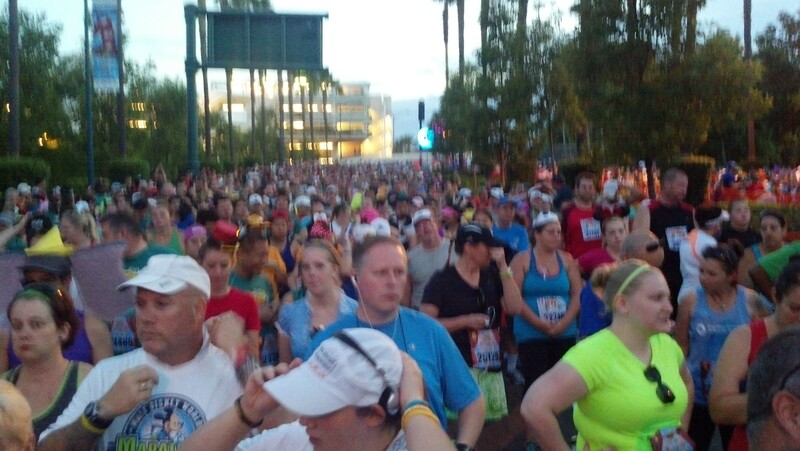 By a little after 5am, we were off to the starting corrals. I try to arrive at the races I do an hour ahead of the race. That gives me time settle myself and focus on the race ahead of me. Plus, it calms the fear of not making it to the start of a race. We stayed at the Red Lion Hotel in Anaheim. So, it was about a mile walk to the starting area. 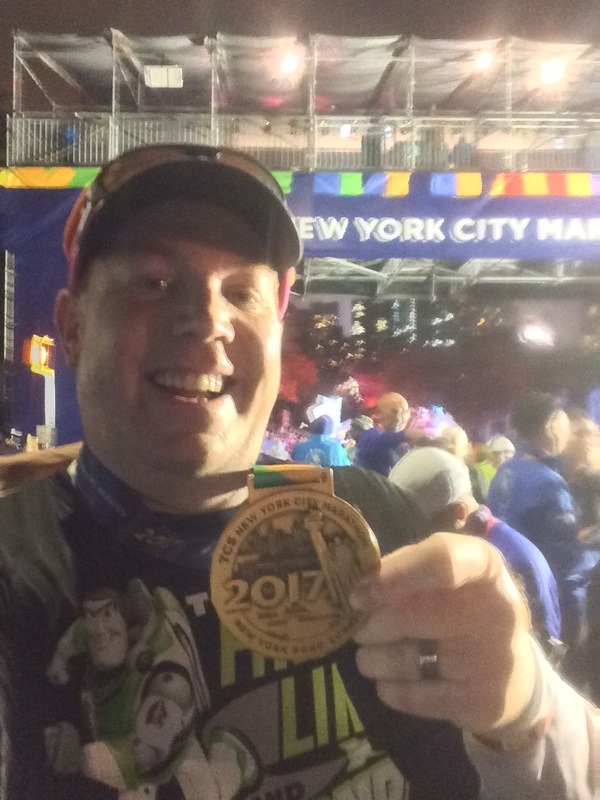 The day before, when I was checking in, the front desk staff didn’t seem to know about any shuttle running early for the runners. 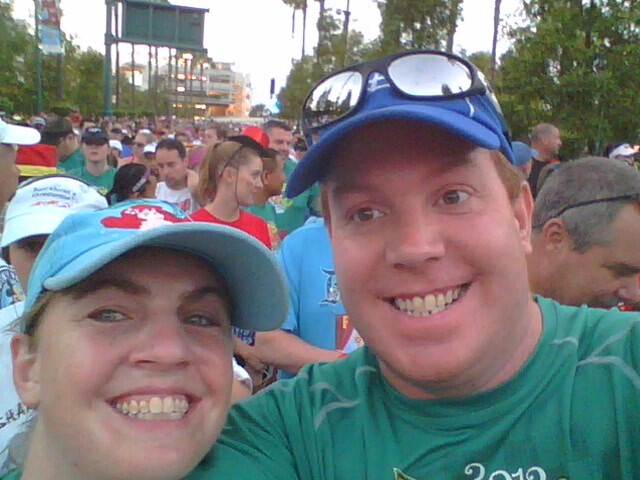 Because of the uncertainty, my wife and I just planned to walk to the start. 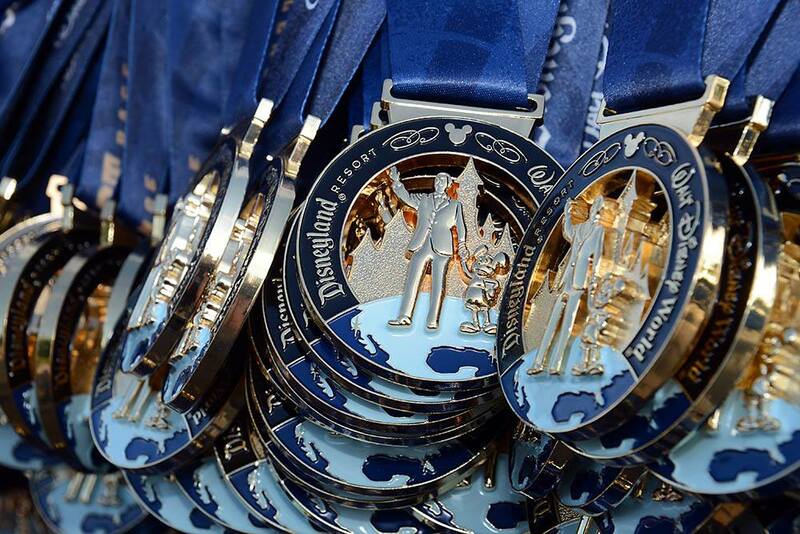 I’m apart of a wonderful Facebook group called #Team Run Disney. They were having a meetup before the races. This one was scheduled for 5:30am. So, I was trying to make it to the meetup. However, we ran a little late and I missed it. Oh well. As my wife would say…life continues. 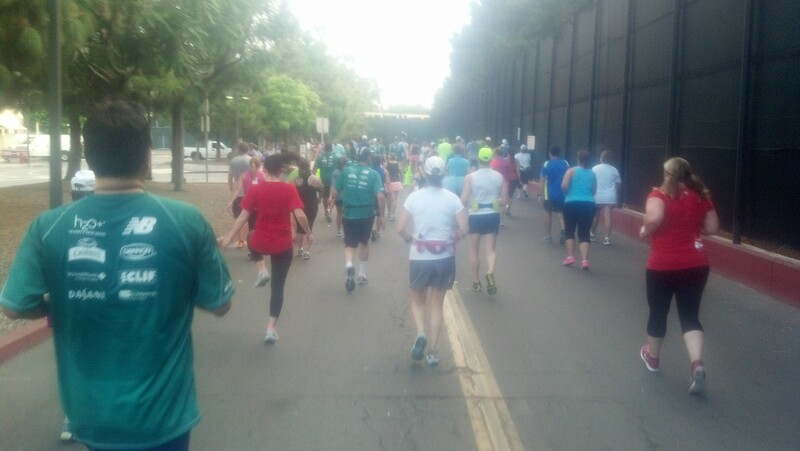 The scene at the starting corrals was a bit chaotic. 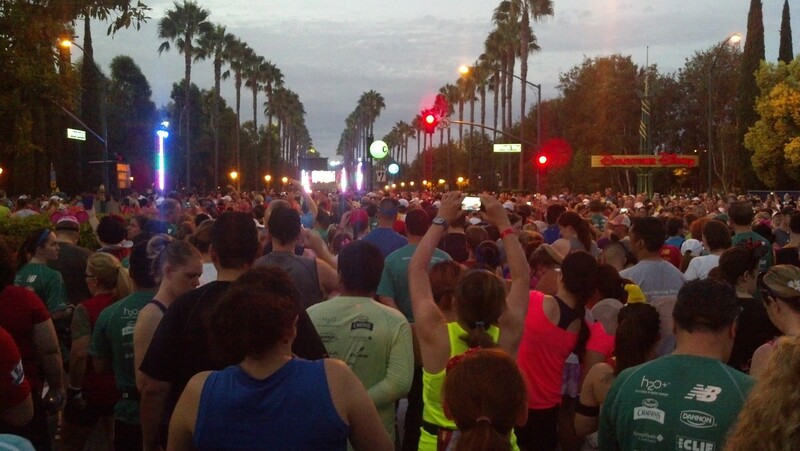 Personally, I think that starting a 5K race at 5:30am and then expecting to get over 7,000 people organized to start the 10K at 6:15am was a bit too ambitious. As of 6am, all the people we encountered seemed clueless as to where to go. We eventually found our way to the corrals and ended up in corral F (we were supposed to be in corral G, but couldn’t find where that corral was). In corral F were a mixture of people who had E’s, F’s, and G’s. So, we decided to stay there. I should say that, when we arrived, the humidity was more than us Southern Californians are used to dealing with. I know those who came from other parts of the country probably wouldn’t feel the same as us, but it was hot and humid. Even at 6am. By the time the race started for us, I was already sweating. They had a trumpet player play the national anthem (which I loved!). 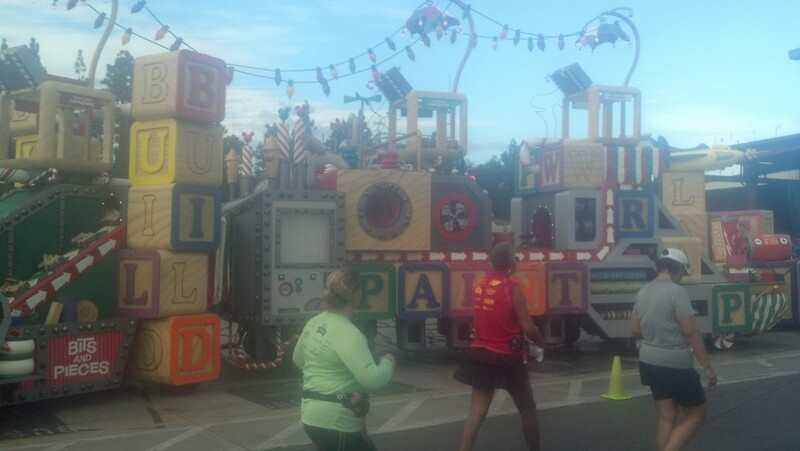 The hosts that they get for the runDisney races are great at keeping the energy going as we waited to start. 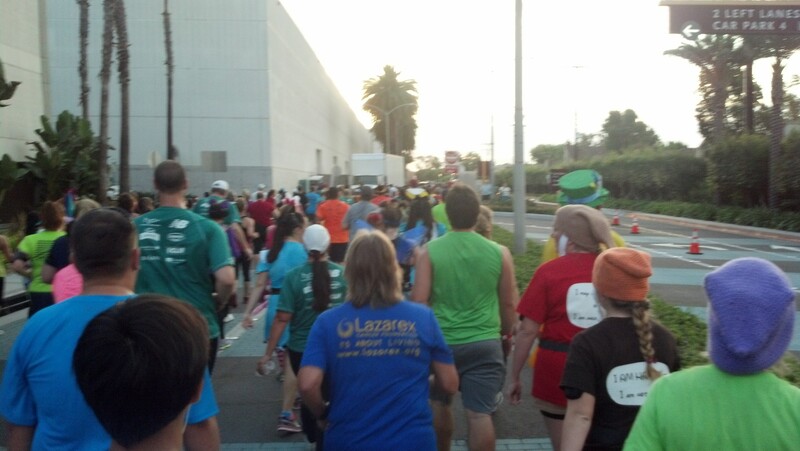 Since we were in corral F/G, we had to wait through several groups of starters. So, having the hosts keeps us from getting too bored. Then, it was our turn to start! I thought that it was cool that people poised themselves on top of this to take pics. See them? 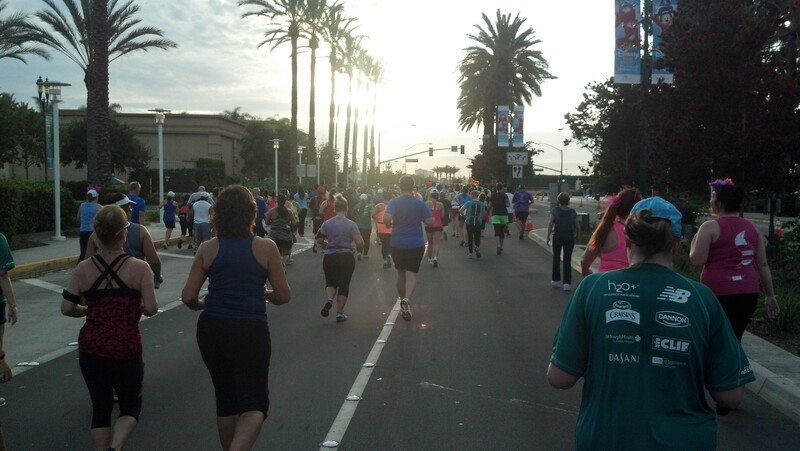 The route started off on the streets of Anaheim. 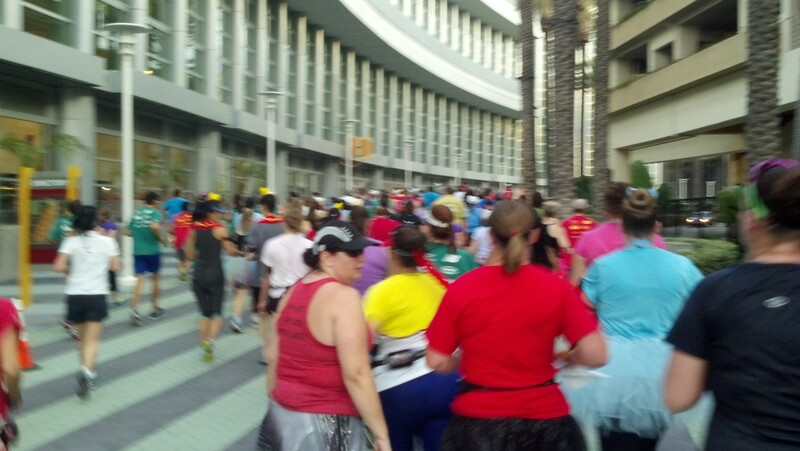 We started off on Magic Way and headed off to the Anaheim Convention Center. Around the first mile marker, we got our first water stop. I’m not too sure that I liked having the water stop and first mile marker so close together because it made it hard to get a good picture of the mile marker. 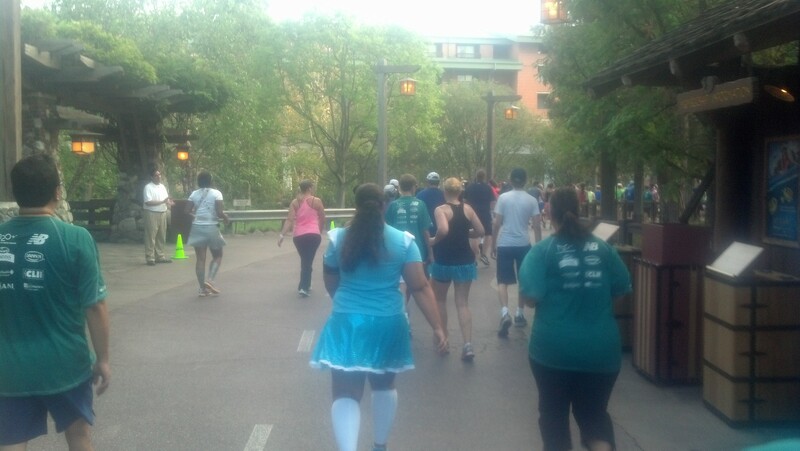 The folks at runDisney had some great mile markers for this race. So, I’m kind of bummed that I couldn’t get a better picture than this one. 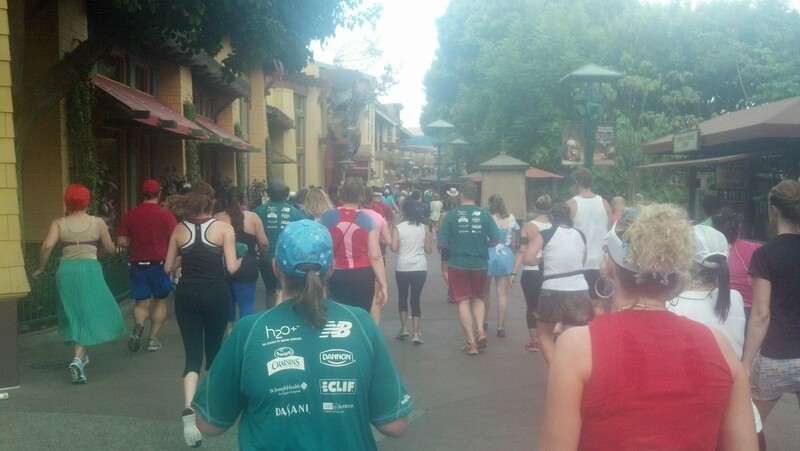 We eventually found our way back up to Harbor Blvd., where we would turn Left and make our way towards the theme parks! Before too long, we were coming up on the 2nd mile marker. 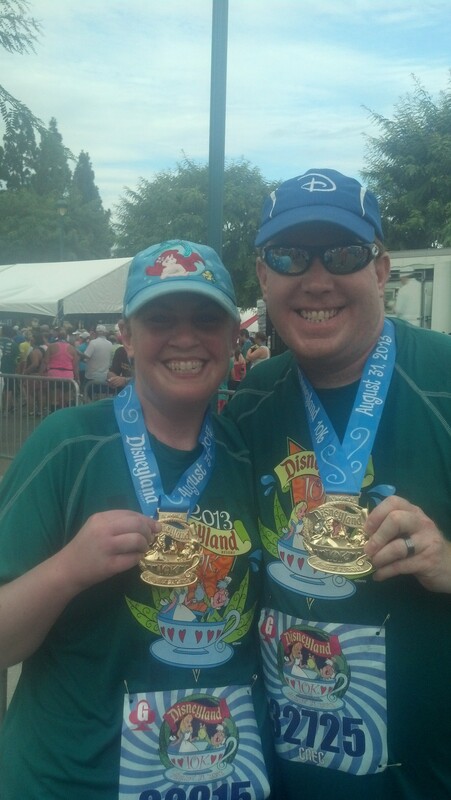 I encouraged my wife by telling her that we finished the second mile faster than the first. 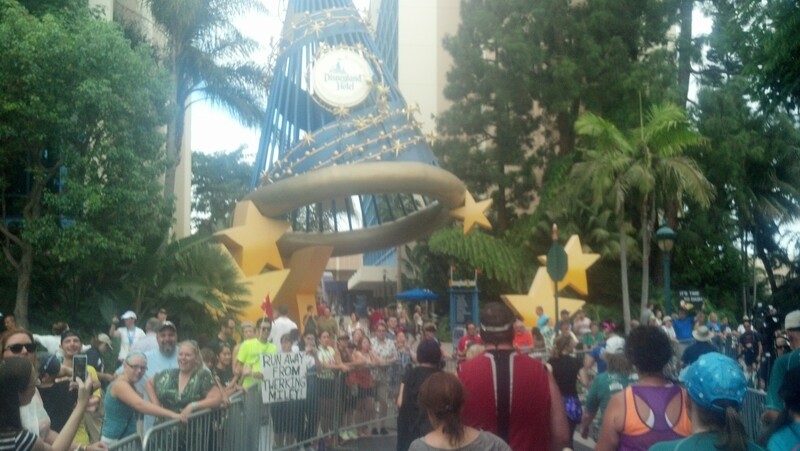 At the 2nd mile marker, I found some #Team Run Disney folks lining up for their photo. From here, we made our way backstage at Disney California Adventure. I love that we get to take photos backstage. As a Disney Cast Member, this is a huge no, no. 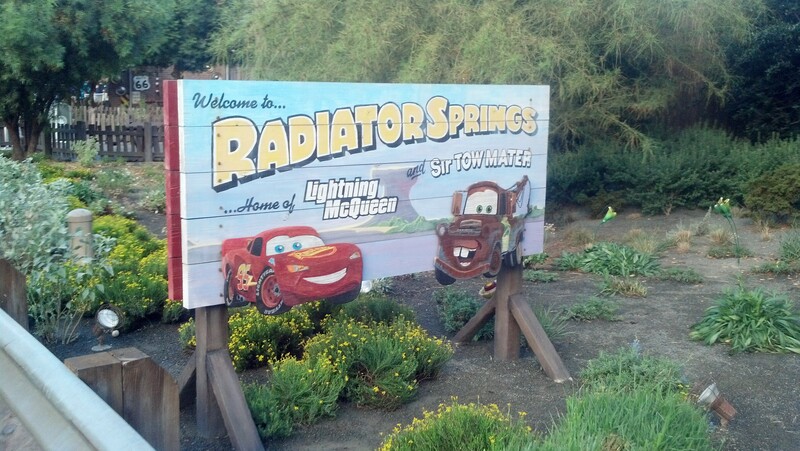 Welcome to Radiator Springs! 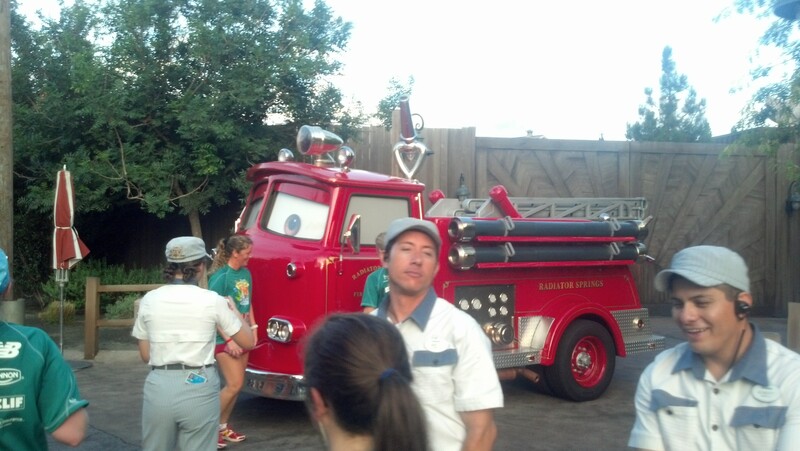 In Cars Land, my wife needed a bathroom break. She was intending to use the porta potties before the race started. 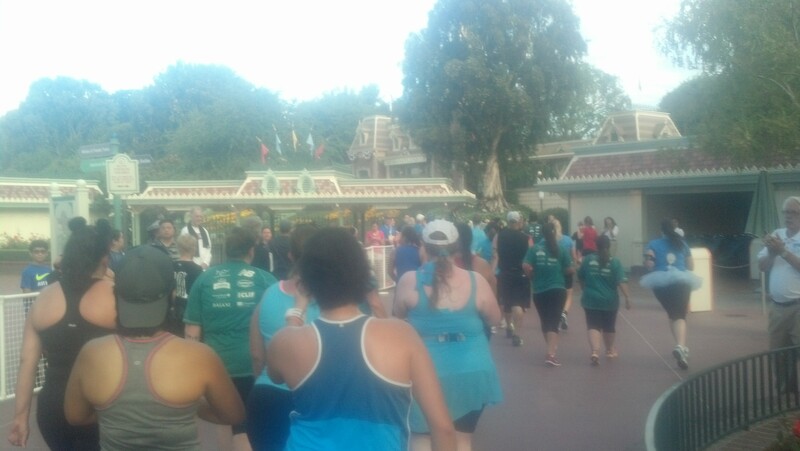 However, with the chaos at the corrals decided to wait until we got in the theme parks to use a real restroom. 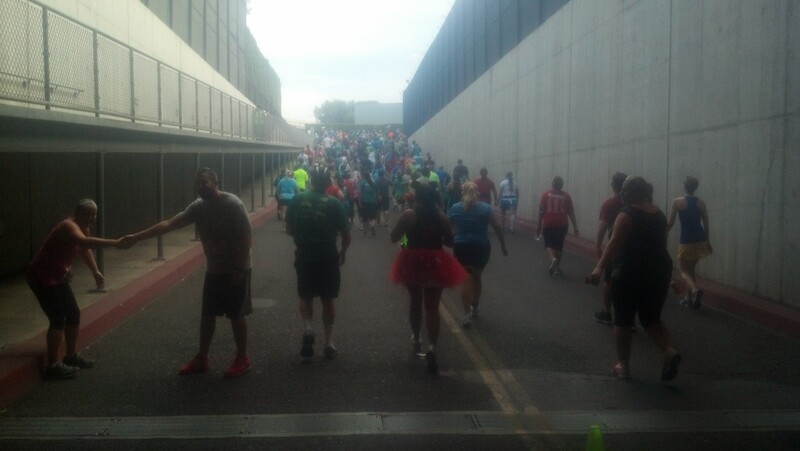 While I waited, I took this picture of all the runners coming at up Route 66. 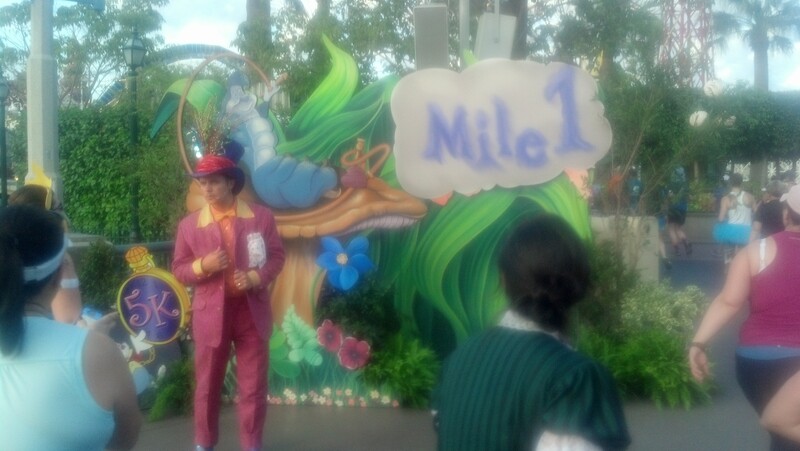 On the way, we came across the Mile 1 marker for the 5K race. 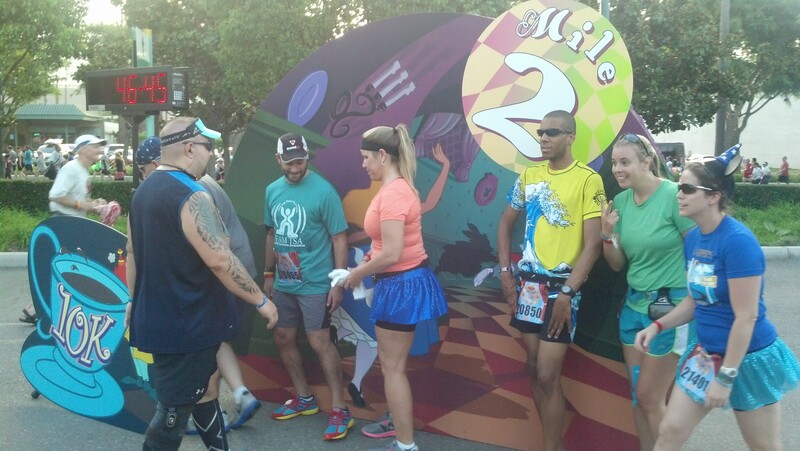 All of the runners around us thought it was funny to see a Mile 1 marker so close to the Mile 2 marker. I love the Paradise Pier area! We headed up towards Ariel’s Grotto, California Screamin’, and Toy Story Mania. 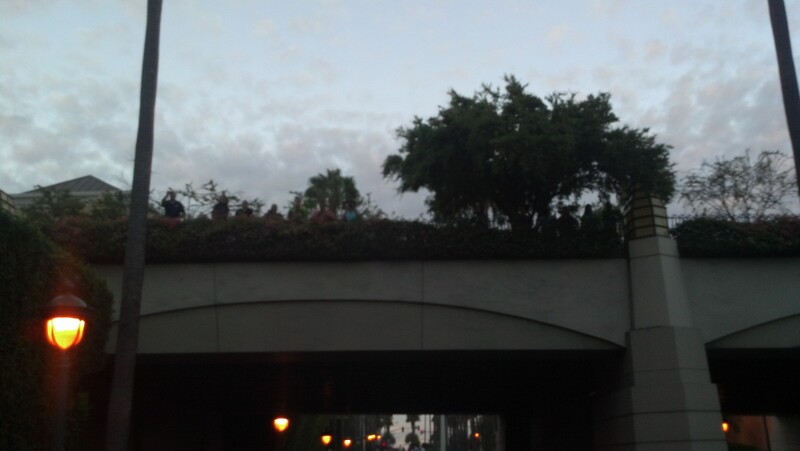 The line you see above was to get a picture with Woody and Jesse. As we continued on around Paradise Pier, we saw the World of Color fountains were going. In the day time, it’s not as cool as when it’s dark. We headed up the Condor Flats area, by Soarin’ Over California and towards the Carthay Circle Theatre. 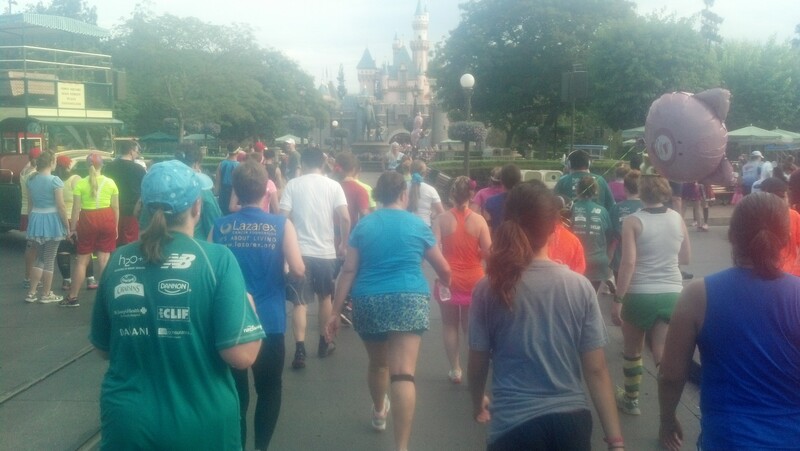 During the Tinker Bell Half Marathon, we crossed this area twice. 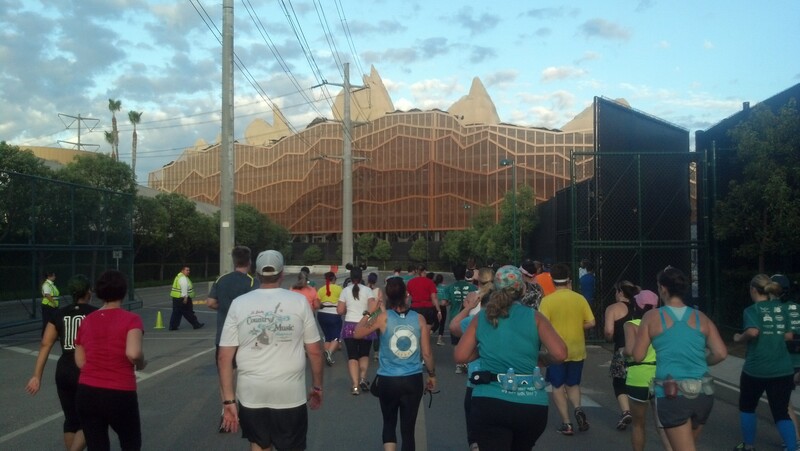 Thankfully, this was the only uphill part of the 10K course. By the time we got here, all my wife could think about was the Jamba Juice we were going to get after the race. She kept telling me that was her motivation to keep going. This was the first time she had ever faced a fourth mile in a race. 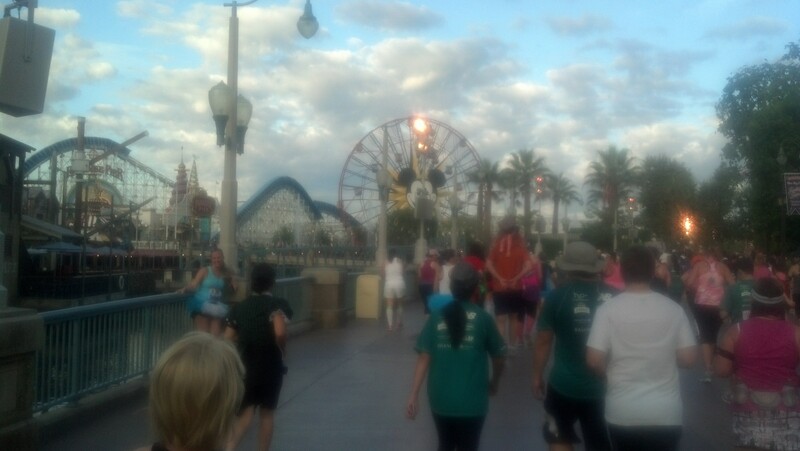 We ran down and then walked up this part of the course. 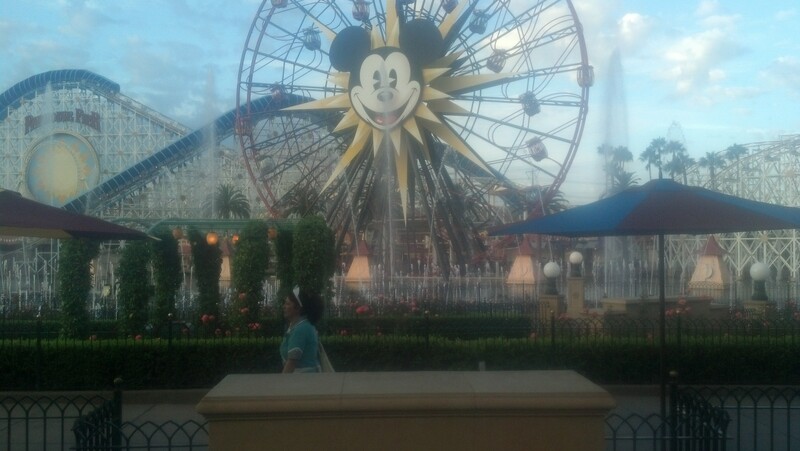 We made our way out of DCA and on to Disneyland. Here we are backstage at Disneyland. 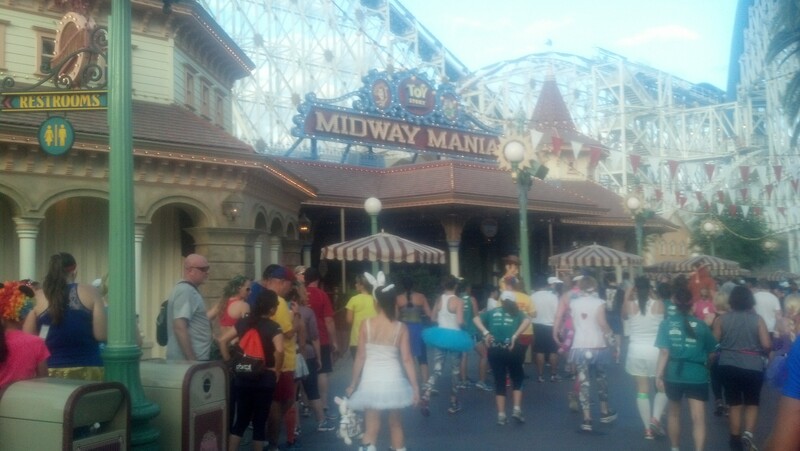 When we got to the entrance of Disneyland, it was like magic. There was a cool breeze and the weather seemed to cool down a little. No complaints here. 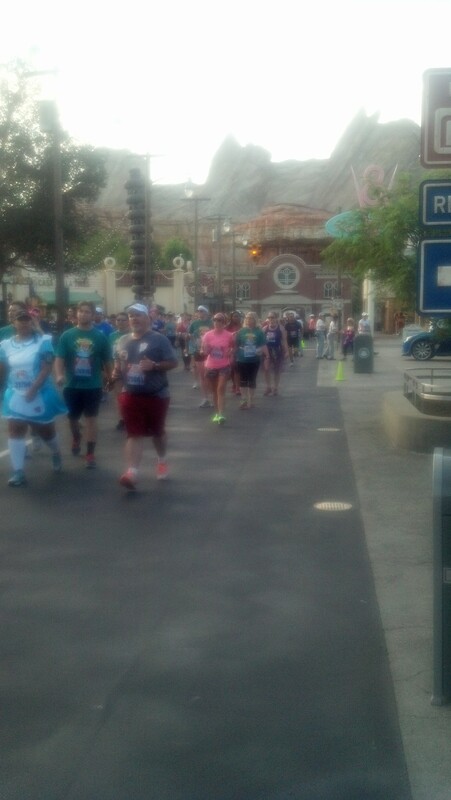 Right before heading up Main Street U.S.A., we had our second water station. Brooke was thrilled to get more water! I was surprised that the water station was on stage because of the mess that is left behind. 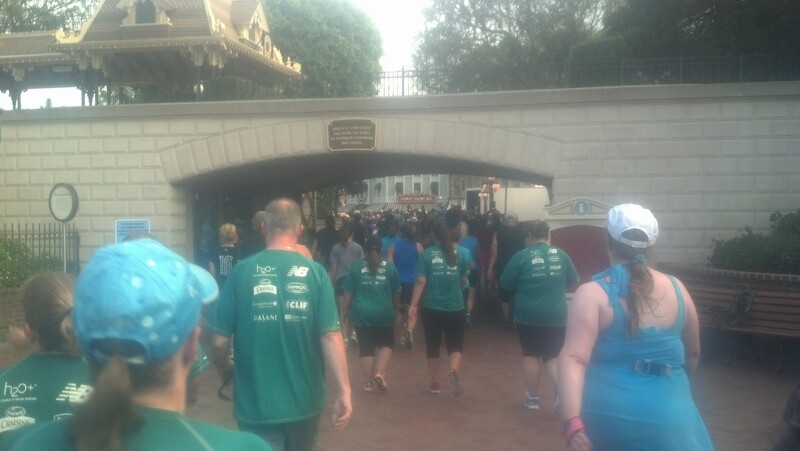 It was great to get to run up main Street U.S.A.! I took pics because I knew the next day I might not be thinking about picture-taking. I know the Disney World fans always comment on how small our castle is. To be honest, it makes me cringe every time I hear that. I’ve been to the Magic Kingdom and know that Cinderella’s Castle is larger than Sleeping Beauty’s. However, I sometimes wish that the Disney World fans would just leave the size part out when talking about our castle. I still love the castle at Disneyland. Walt was limited on the size he could make that castle back in 1955. Mile 4!!!! Only 2.2 miles to go! From here we made our way past Innoventions (where the 4 mile marker was), the Nemo Subs and around the Matterhorn towards the outside of Fantasyland. 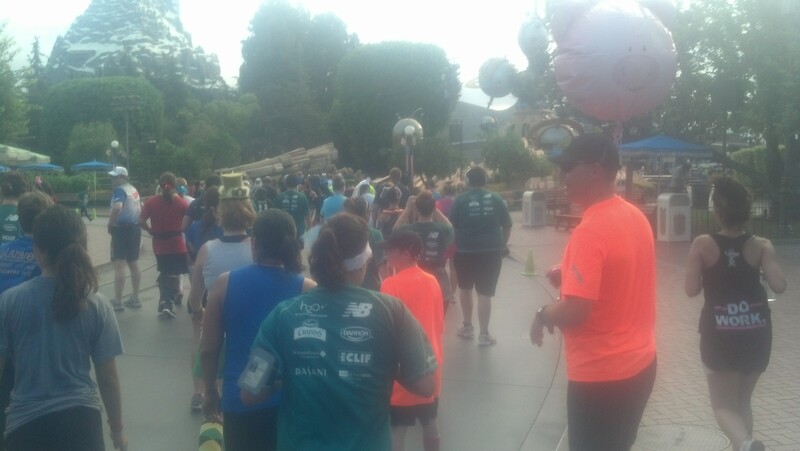 From there, my wife recognized the path as the one we took in the Neverland 5K. 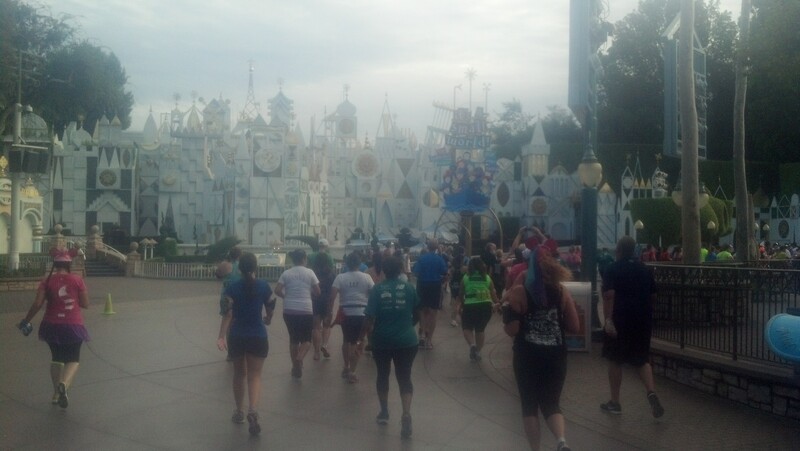 Of course, in that race, it was dark and It’s A Small World was all lit up for the Holidays. So, when we got here, it wasn’t quite the same. 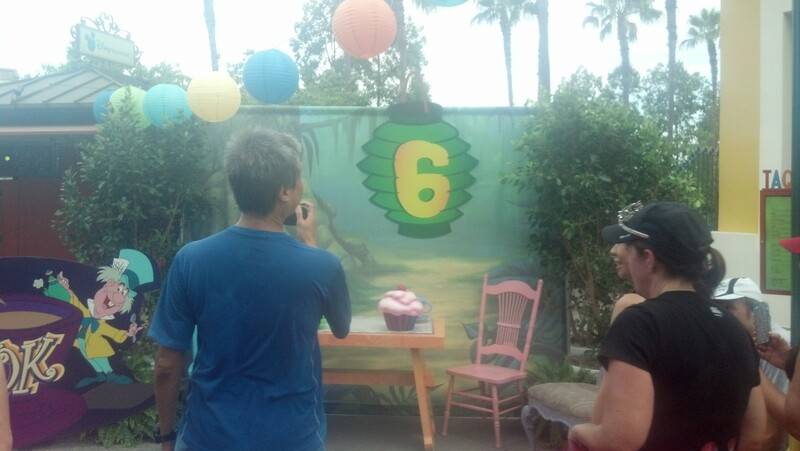 Much like the Neverland 5K, we made our way backstage. 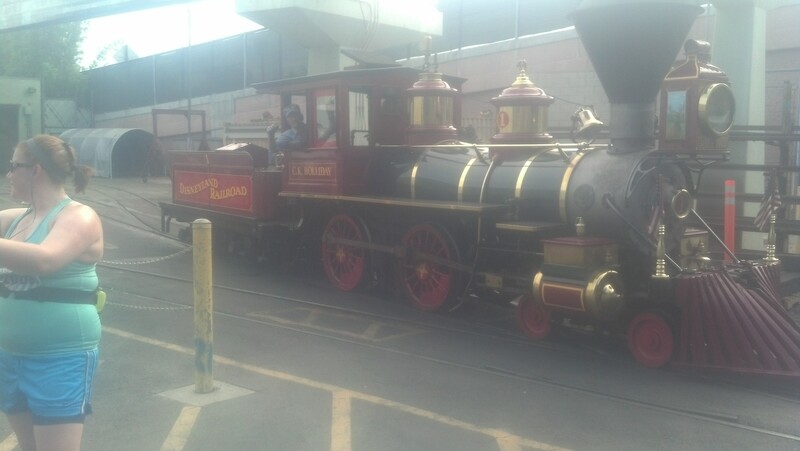 Unlike the Neverland 5K (and Tinker Bell Half Marathon), they had this Disneyland Railroad engine set up for us. Pretty cool! 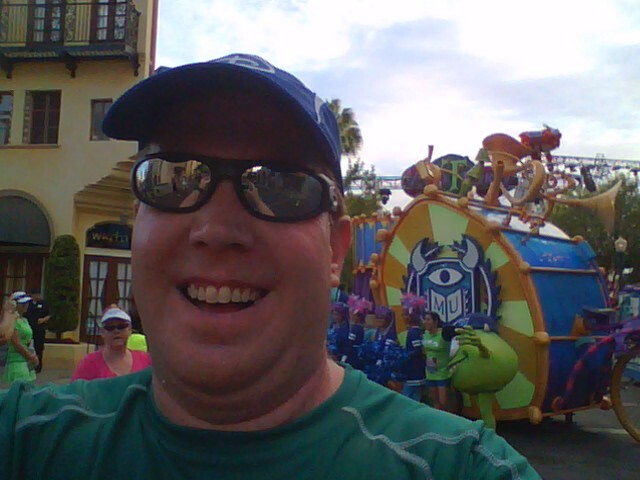 They had floats set up for us to get pictures of/with. 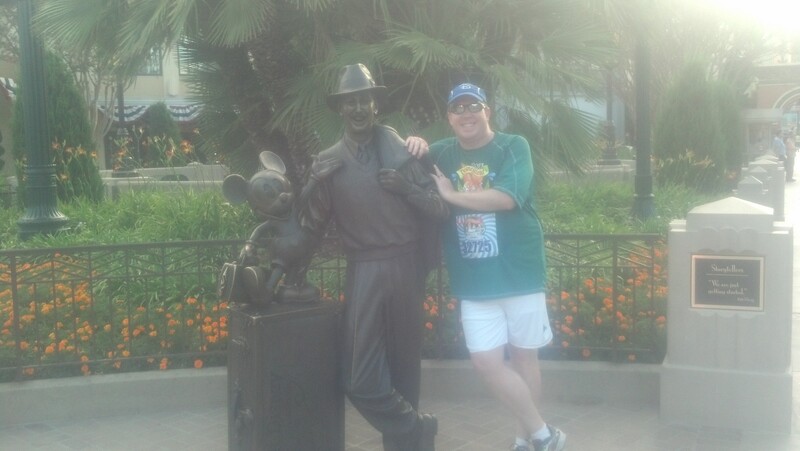 Again, as a Disney Cast Member, it’s hard to resist taking pictures we are not normally allowed to take. 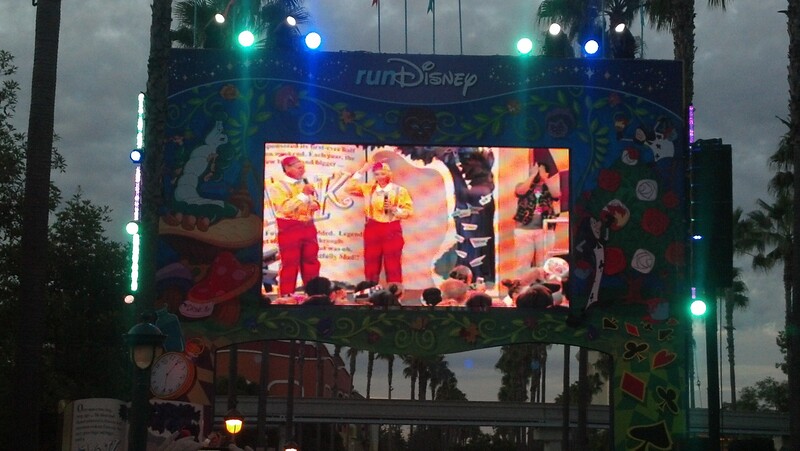 We came back on stage at Toon Town. 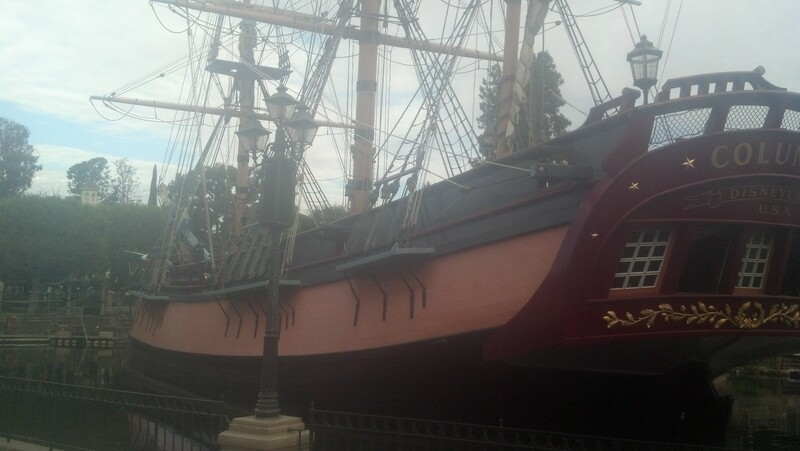 It’s fun to run back here because my wife and I don’t come back this way often during our Disneyland visits. 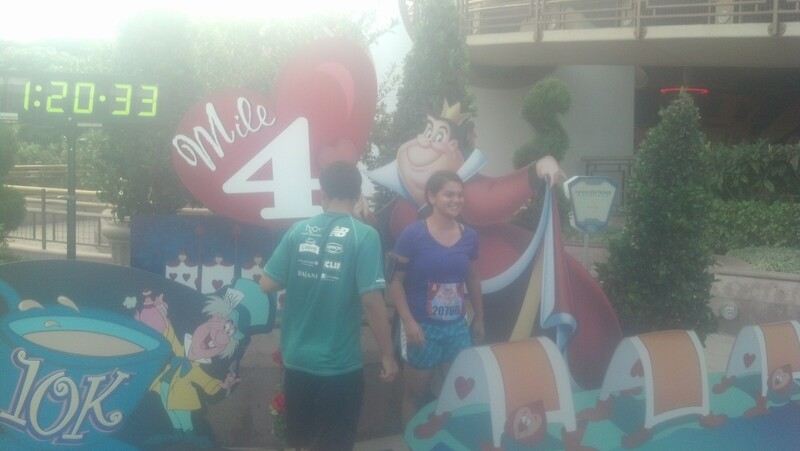 We ran back up through Fantasyland and made it to the 5 mile marker! 1.2 miles to go! Needless to say, the sight of the 5 mile marker made my wife very happy because she knew the finish was coming up. 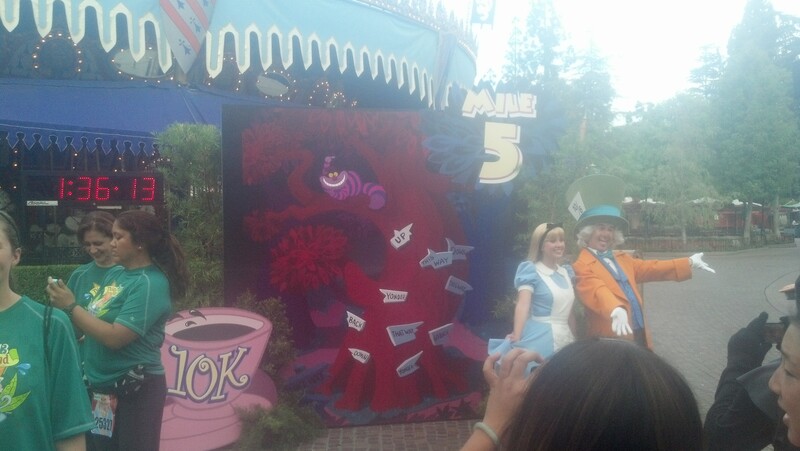 It was nice to see Alice and the Mad Hatter. This was Alice’s race after all. The line to get pics was too long and Brooke was ready to finish. 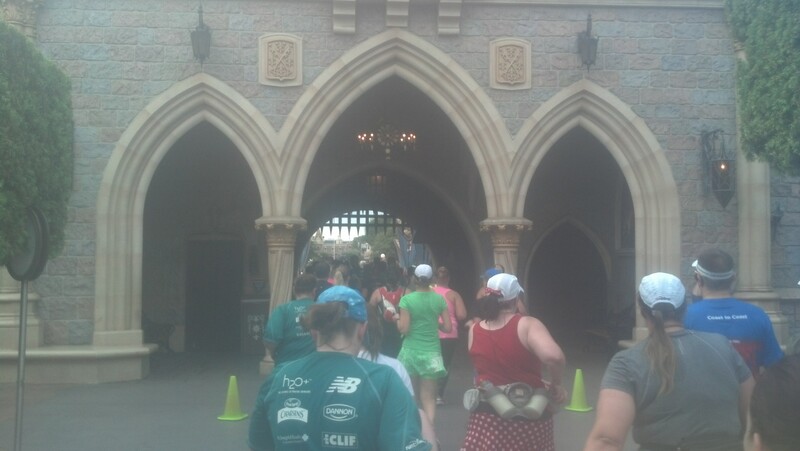 From there, it was time to go through the castle! It was crowded going through and still crowded as we got on the other side. 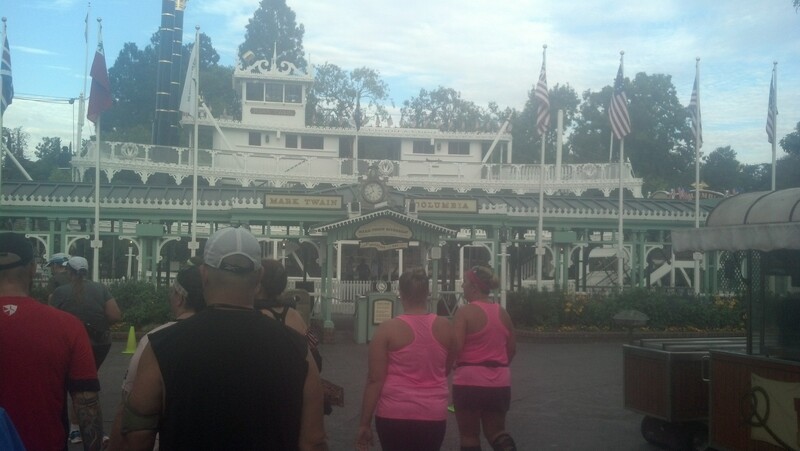 We headed to the right from the Hub towards Frontierland and made our way to the Mark Twain. 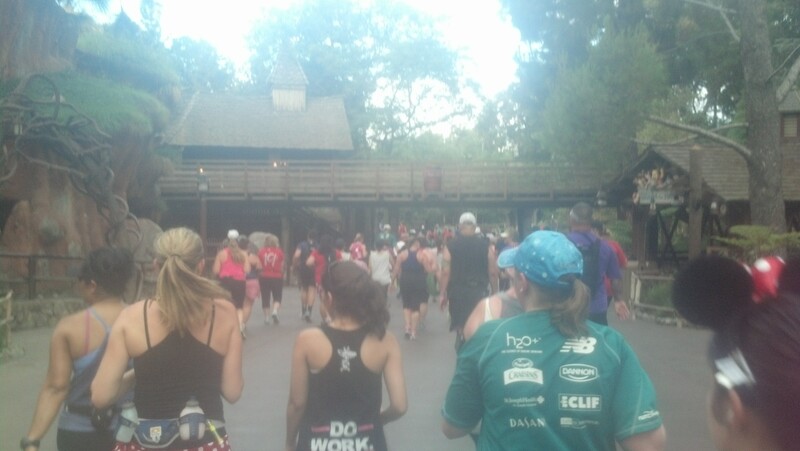 We continued on through Critter Country and headed back stage just past Splash Mountain. Somewhere backstage, we came across the final water stop. Brooke was very happy to get more water because it was getting hot again. 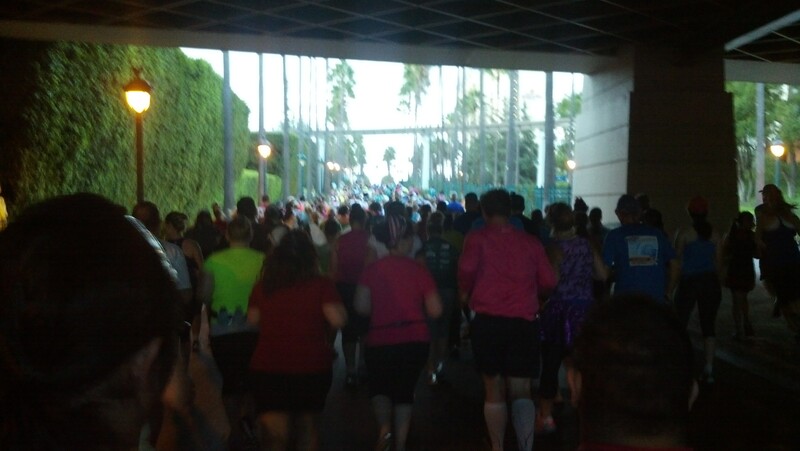 We came out from the backstage area to run through Downtown Disney. 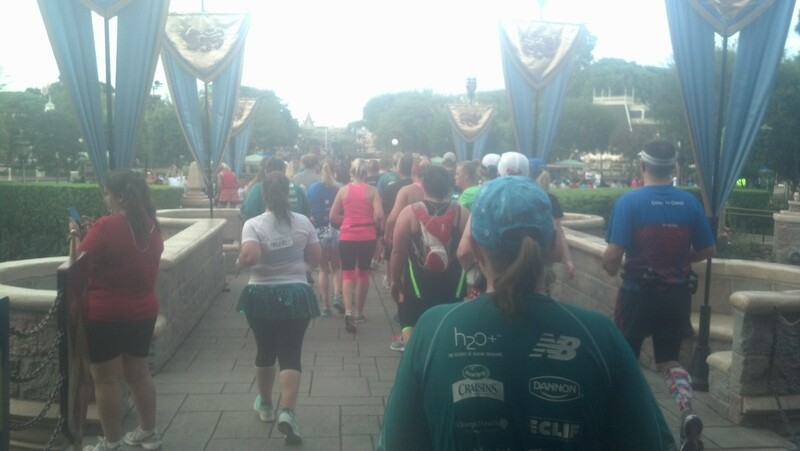 When I ran through this area at the Tinker Bell Half Marathon, my picture didn’t come out very good. So, I am very happy that this one turned out better. 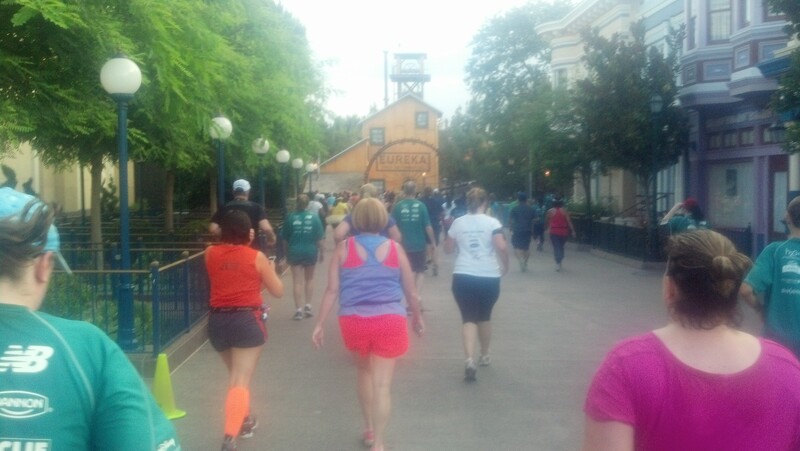 In Downtown Disney, we came across the final mile marker. 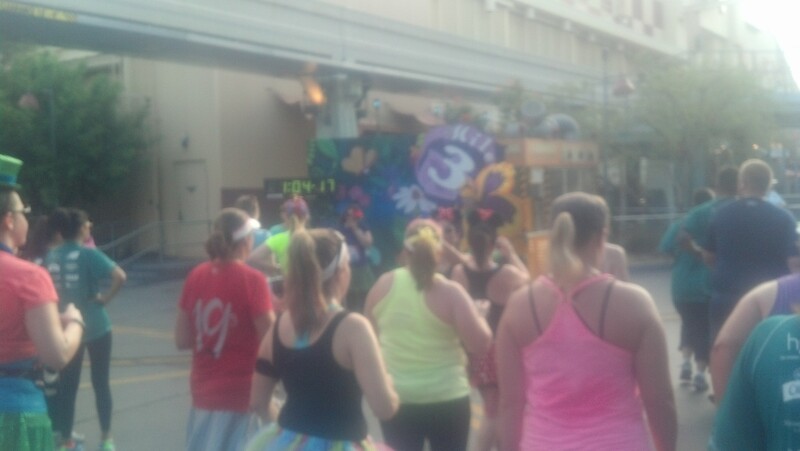 Mile 6! Again, there was a long line to get pics here and Brooke just wanted to be finished. So, we moved along. 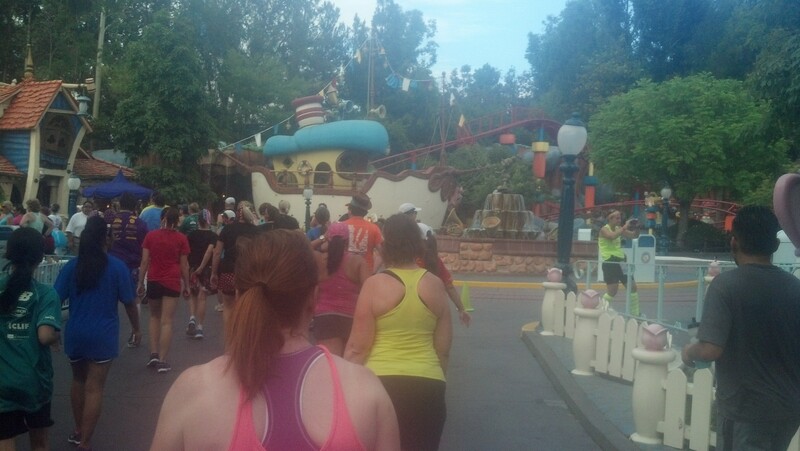 Ah, the final turn at the Sorcerer’s Hat. 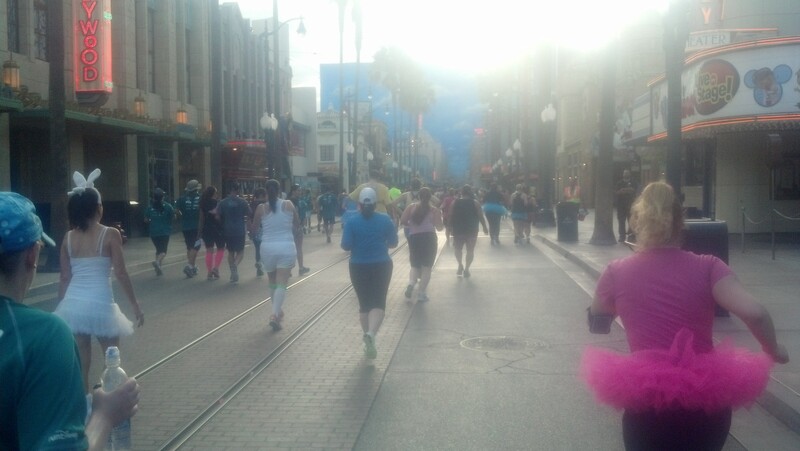 Once we turned the corner, we saw..
Brooke and I have now completed 4 races together. In the last two we’ve talked about what we wanted to do at the finish and have never done what we planned. 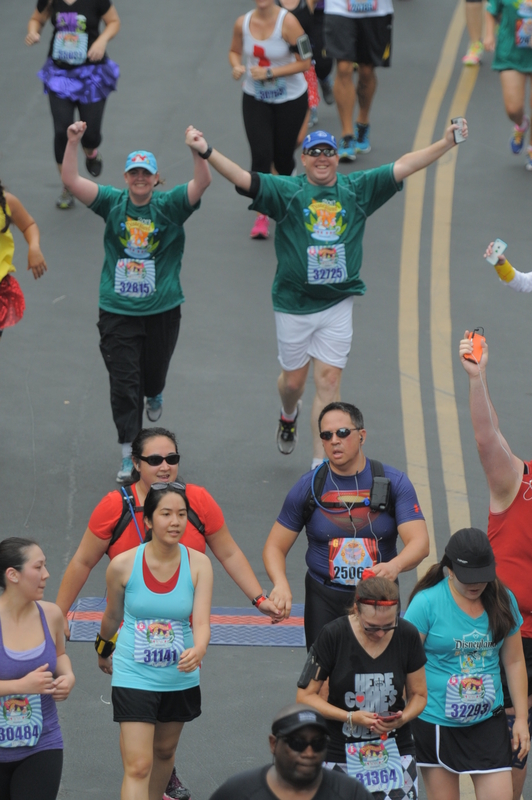 So, at the finish of the Disneyland 10K, Brooke made sure we’d finish this race hand in hand! I made sure to not sprint too fast. I think we got this one right! Two 10K finishers with the awesome Alice medals to prove it! I’m so proud of Brooke for finishing this race. She did amazing in her first attempt at a 10K race. I couldn’t be more proud. She pushed herself as hard as she could and wouldn’t quit. You can’t ask for more than that. 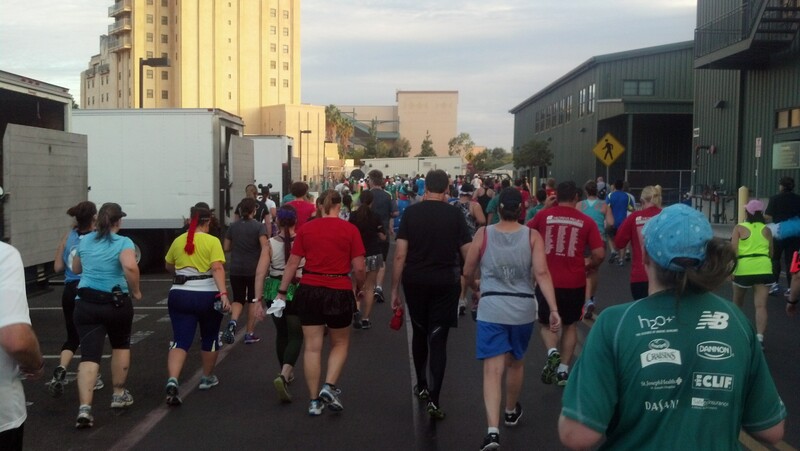 Up next…the Disneyland Half Marathon! 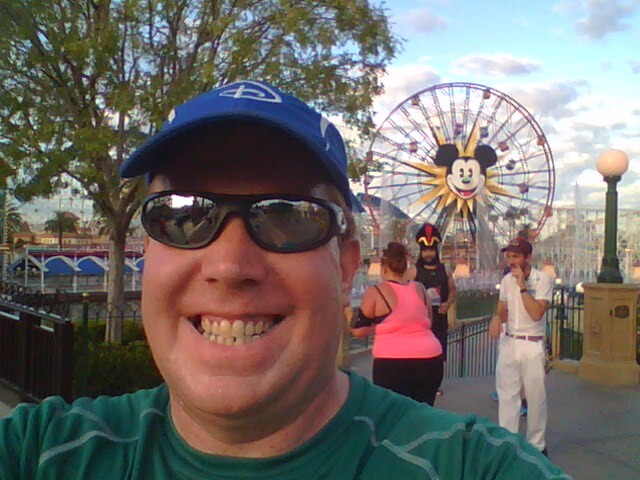 I was right near you when you took the picture with Mickey’s Fun Wheel in the background! Jafar was over to the side of us! Too funny- so close, yet so far. Great recap! That is too funny! So close, yet so far. That was the story of my DL Half Weekend. So many bloggers that I follow, I saw for a brief moment and it didn’t register with me who they were until they were out of sight. 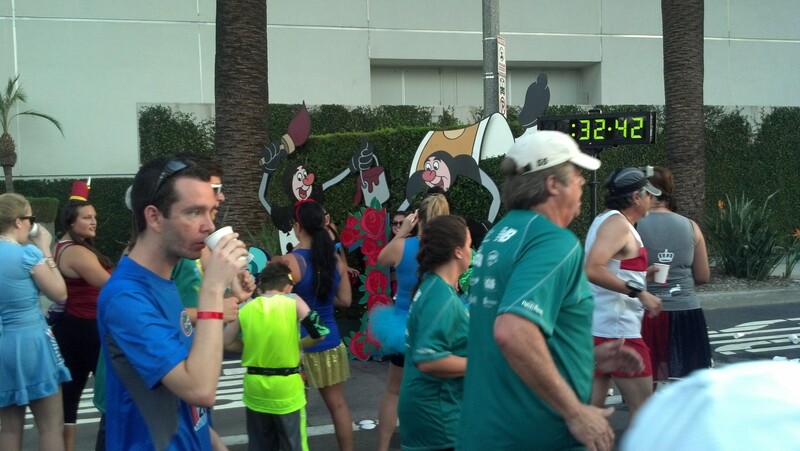 Did you see Linzie in my picture of the 2 mile marker? I didn’t even know he was there until I saw the picture. 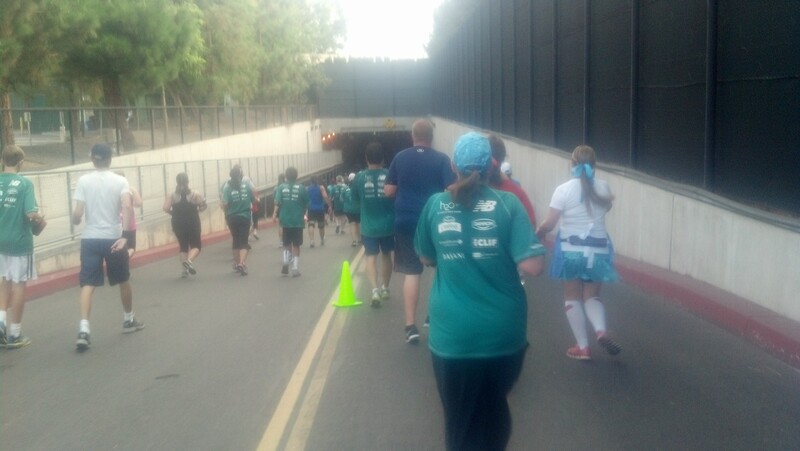 I saw Linzie and crew right around mile 1 actually. 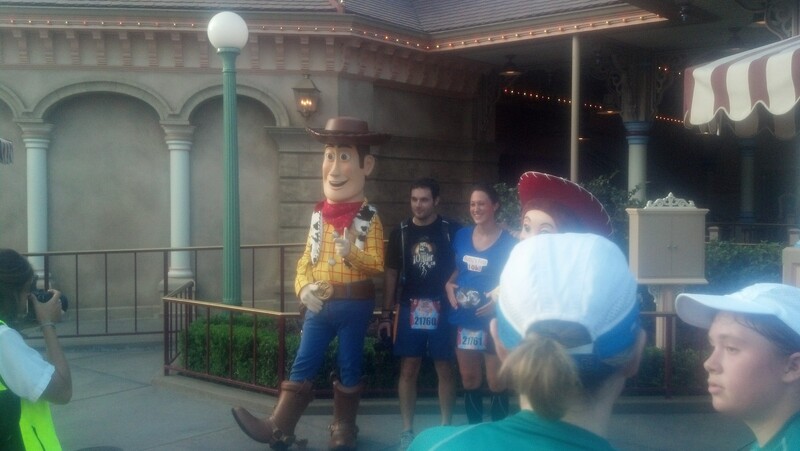 It didn’t register until later that he was running with a bunch of TrD folks- I felt so rude for not talking to them all! Sorry guys- was just trying to breathe in the swamp and wasn’t focused. 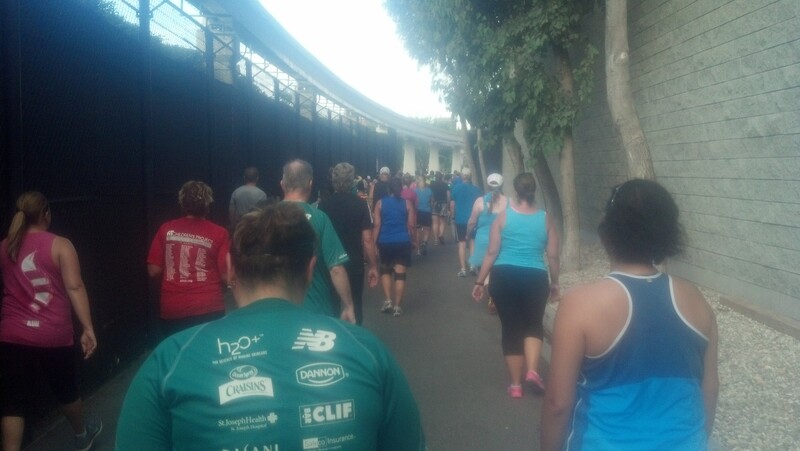 During the 10K I ran into a ton of TrD peeps- and forgot to grab pics! Fun race! I love that this was your first race together! How special!!! 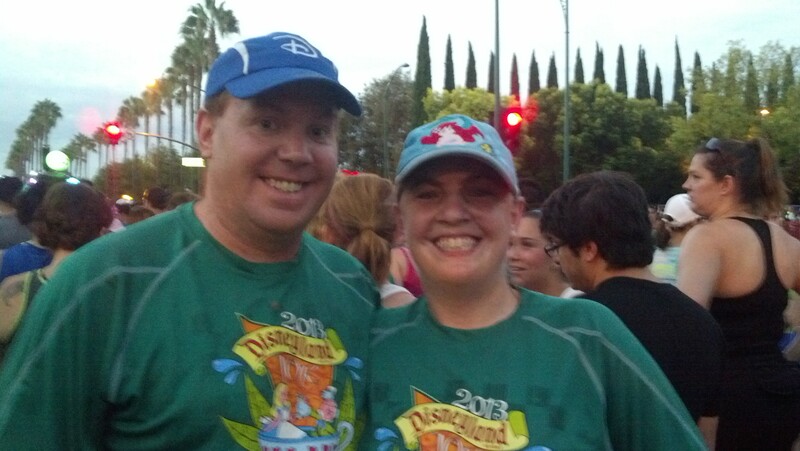 It was our 4th race together, but her first 10K. It was special and pure joy to watch her finish! I had an issue posting to comments so what I meant to say was 10K and not race! I did read the entire thing!! I’m glad you made it to the Half Meet Up because we got to meet in person!! Oh, got ya. I’m also glad I got to the Half Meet Up. It was nice to meet you in person as well. Awesome recap!!! I have some of the same exact pictures! LOL!!!! I was also in F. I was the female Wookie….I did do Dumbo and CTC….if it is in your hearts, you will make it so!! Thanks Joy! 2014 will be the year I get my Coast to Coast!